Above the fold describes the area of the web page that can be seen without scrolling and is regarded as the most important real estate on your page. The term is a legacy from printed newspaper days when readers would fold their paper in half to make it more manageable to read. Optimised web pages usually have all important content (e.g. call to action and reasons to buy) above the fold so that users will be able to view it when they land on the page. 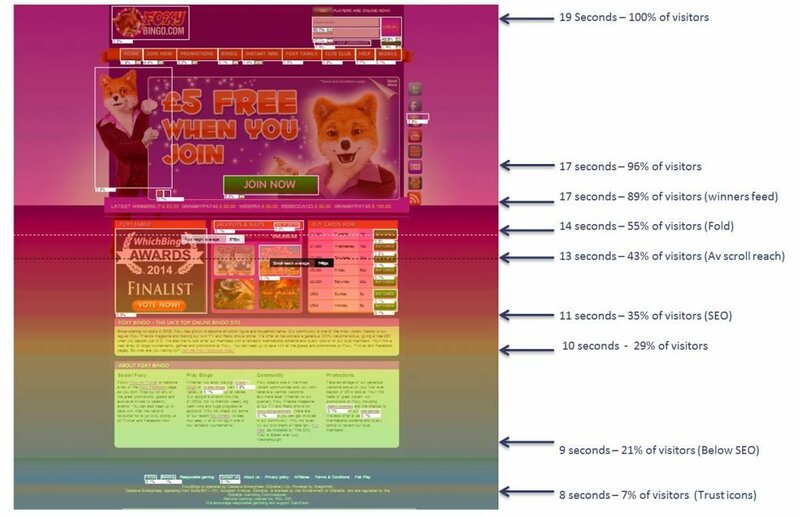 The Click Tale heatmap below shows how almost a half (45%) of new visitors to the foxybingo.com homepage did not scroll below the fold. 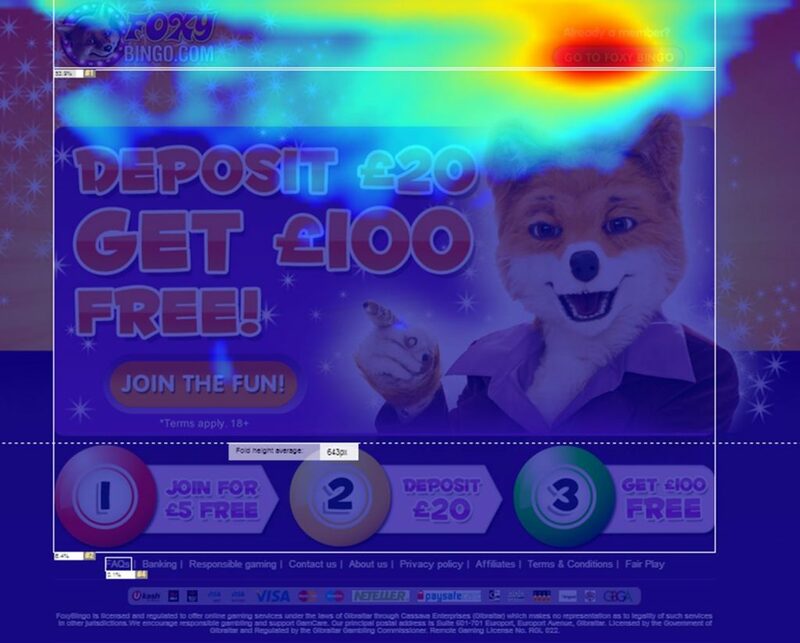 If you don’t have a visual analytics tool for click and scroll heatmaps sign up for a fee trial to see what you are missing. I recommend Hotjar as a cost effective, but flexible tool. With the rise of mobile devices the fold may become less of an issue as mobile users tend to automatically begin to scroll when they land on a page. However, for desktop users look at your web analytics to identify the most popular screen resolution used by your customers. Then get a screen resolution Chrome extension to check where the fold is on your most important pages and see if all your key messages and content are above the fold. The fold may be less important than it once was, but even for mobile devices it remains relevant because what a visitor is first exposed to will naturally influence their behaviour. The fold acts like an anchor and primes visitors whether we like it or not. This is especially the case for desktop experiences, but even for mobile devices users will respond to what they are initially exposed to. So, make sure you are careful about what content you place above the fold as this can have a big impact on your conversion rate. A/B testing solutions – Which A/B testing tool should you choose? Visual analytics – 15 visual analytics solutions to boost revenues.